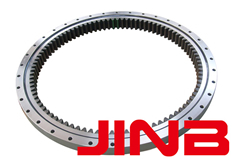 To "slew" means to turn without change of place; a "slewing" bearing is a rotational rolling-element bearing, compared to other rolling-element bearings, slewing bearings are thin in section and are often made in diameters of a metre or more. Slewing bearings often use one row, two rows,and triple rows of rolling elements. They often use three race elements, such as an inner ring and two outer ring "halves" that clamp together axially.